The first priority in reheating any preparation is food safety: All leftovers must reach 165 degrees Fahrenheit before you serve them, per the U.S. Department of Agriculture. 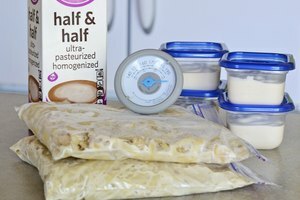 Reheating to 165 F isn't a problem with most foods, but unstable emulsions, such as Alfredo sauce, are a different story. Alfredo sauce separates and curdles at around 170 F, dangerously close to the USDA minimum temperature for safe reheating. The solution: Use a gentle reheating method and monitor the dish's temperature with an instant-read food thermometer. 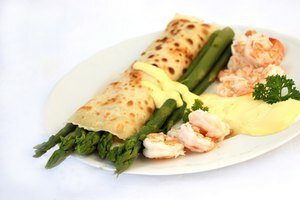 All emulsions -- hollandaise, beurre blanc and chocolate, for example -- maintain stability when warmed using the gentle heat produced by a double boiler. Double boilers work simply: The burner heats a pan of water that heats the bowl containing the emulsion -- slowly, gently and reliably, exactly what Alfredo needs. 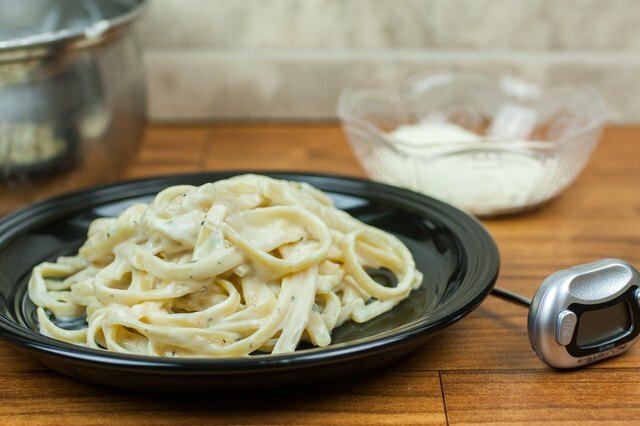 The double-boiler method works best when you're reheating Alfredo sauce on its own. To reheat the sauce using a double boiler, add 2 to 3 inches of water to a saucepan and bring it to a simmer. Transfer the Alfredo from the storage container to a stainless-steel or glass mixing bowl and set it on the saucepan -- there should be at least 3 or 4 inches of space between the water and the bottom of the bowl. Heat the Alfredo for about 5 minutes, stirring frequently, but not constantly. Check the temperature of the sauce -- when it reaches 165 F, take the bowl off the saucepan and stir the sauce vigorously to bring the temperature down to about 150 F, and serve. Oven heating is best for prepared Alfredo meals, such as shrimp, chicken or vegetable Alfredo. If you have a convection oven, use its fan -- the Alfredo dish heats more uniformly and at a lower temperature than it does in a regular oven. You can heat Alfredo in the oven from a frozen or thawed state. 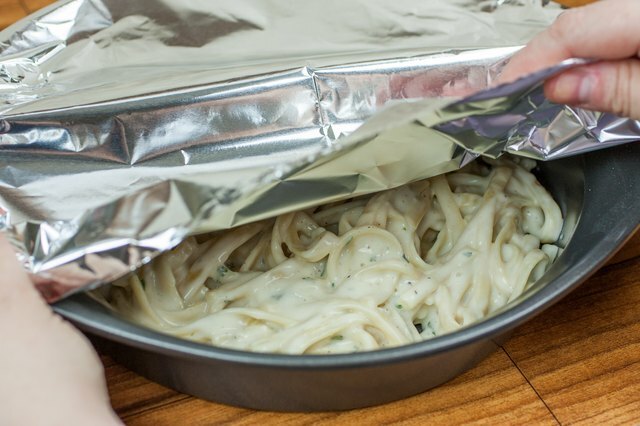 Heat a conventional oven to 400 F or a convection oven to 325 F. Transfer the Alfredo to an oven-safe dish and cover it tightly with aluminum foil. Place the dish on the middle oven rack. 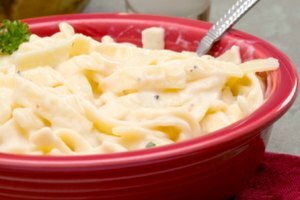 If you're heating frozen Alfredo, bake it for a total of 50 to 55 minutes, or until it reaches 165 F in the center. 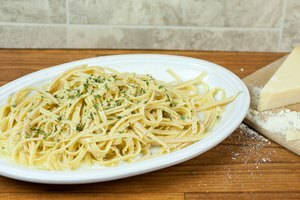 For a thawed Alfredo dish, bake it for 40 to 45 minutes, or until it reaches 165 F. After 25 minutes of heating, remove the foil from the dish and thoroughly stir the Alfredo. Replace the foil and resume cooking. Stovetop reheating in a saucepan works for both thawed Alfredo sauce and prepared Alfredo dishes, but not frozen. The key to maintaining a homogenized, smooth sauce is low heat, steam and temperature control. You'll need a deep, heavy-bottomed pan. Heavy pans -- cast-iron and triple-ply stainless-steel -- heat evenly and slowly and retain heat longer than thin-gauge pans, a must for scorch prevention. 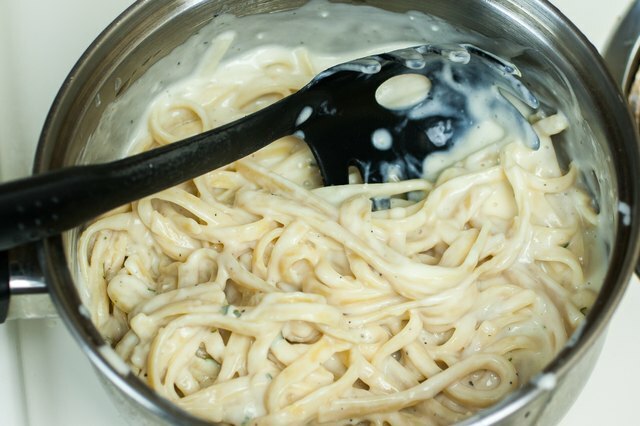 Transfer the Alfredo to a deep, heavy-bottomed sauce pan. Set the heat to low and cover the pan with a tight-fitting lid -- this build steam and raises the temperature inside the pan without increasing the heat of the burner beneath it. Heat the sauce or dish for 5 minutes, and give it a stir. Next, check the temperature using an instant-read thermometer -- it should read about 100 to 110 F. Cover the pan, and continue heating for another 5 minutes. Again, stir and check the temperature. Once the Alfredo reaches about 130 F, remove the lid and increase the heat to medium-low. Stirring frequently, allow it to reach 165 F. When it reaches 165 F, stir the Alfredo vigorously to lower the temperature by about 10 degrees before serving. Almost any mistake made in the kitchen can be fixed -- undercooked pasta, broken emulsions and improper ingredient proportions are all easily corrected. There's one error, however, that all the chefs in the land can't repair with their combined efforts: You can't fix burnt. 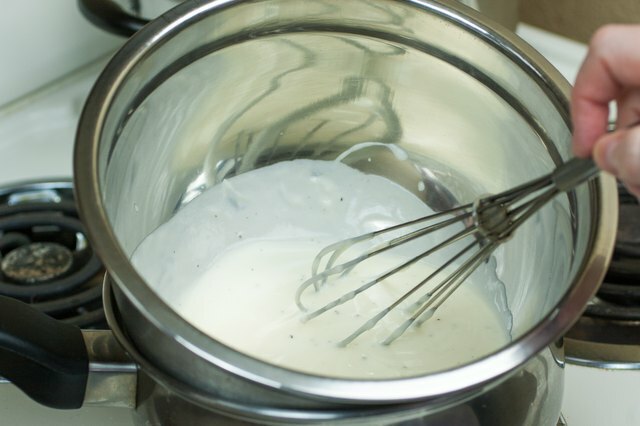 Cream-based sauces, such as Alfredo are highly susceptible to scorching -- if you use a thin-gauge pan, which is prone to hot spots, and so much as a teaspoon out of a quart of sauce scorches, the entire batch develops a charred taste and you must throw it out or suffer through eating it. Scorching aside, if the Alfredo separates during reheating, lower the heat, flick a few drops of cold water from your fingertips into it and stir. 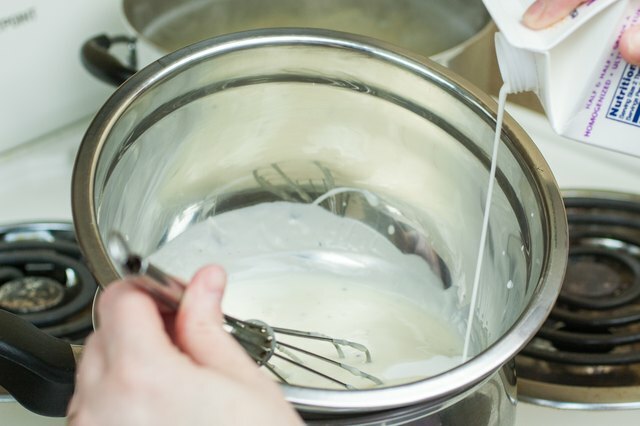 Next, add about 1/2 tablespoon of heavy cream to it -- the cream acts as a glue that helps bond the fragile water and fat molecules back together. You can also whisk an egg yolk into warm Alfredo to bring it back together if it breaks. The Kitchn: Food Science: Why Did My Sauce Break? The Kitchn: What's the Best Way to Reheat Cream-Based Pasta Sauces?